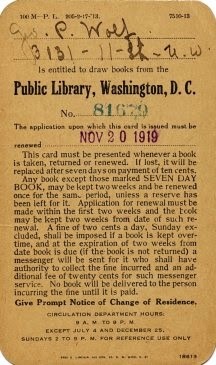 One of the categories of librariana that I collect is library cards. Below are some recent additions to my collection. 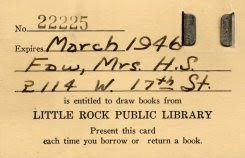 More vintage library cards can be found HERE. 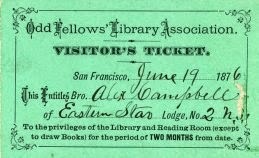 Early library cards were sometimes called "tickets". Welcome Back to Chicago ALA Midwinter! The American Library Association will hold its Midwinter Meeting in Chicago in 2015 for the first time since 1991. Many aren't looking forward to a meeting in Chicago in the middle on winter. Prior to 1991 ALA midwinter meetings in Chicago were the rule, not the exception. In fact, prior to 1965, all midwinter meetings dating back to 1908 (with only 7 exceptions) were held in Chicago. Starting in 1965 midwinter meetings were also held in Washington, D.C. every four years. Midwinter meetings were held at only a few locations other than Chicago or D.C. through 1991. But after 1991, ALA said "Goodbye" to Chicago as a midwinter meeting site. The rationale was obvious. Too often terrible winter weather greeted meeting goers in Chicago. Prior to 1980 all my library jobs were in the South, and I certainly complained about the Chicago midwinter location. There are lots of tales of meeting goers arriving late or leaving late because of weather in Chicago. Of course, there were also good times at midwinter meetings in Chicago. 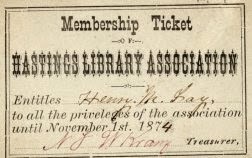 One year a group of librarians stranded at the Palmer House in Chicago created a fake organization called the ALA Players. I personally have many fond memories of midwinter meetings in Chicago. I'm sure there will be many complaints about the return to Chicago, but lets face it you take your chances traveling anywhere in the U.S. in the middle of winter. I now live about 150 miles northwest of Chicago, and I'll be weighing the pros and cons of driving down for a day at Midwinter. The button above was distributed at the ALA midwinter meeting in Chicago in 1991. The postcard above depicting the bookmobile of the Albuquerque (NM) Public Library was given to me by Norman Stevens, one of the world's greatest library postcard collectors. Norman donated his collection of approximately 25,000 library postcards to the Canadian Centre for Architecture and it is now part of the Norman D. Stevens Collection of Library Architecture. This one got left out of the CCA donation. I'm grateful to have the postcard since it was part of Norman's collection. It also has several other aspects that are of interest to me. 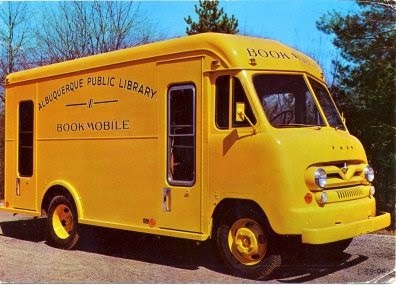 I collect bookmobile postcards so obviously that's the first aspect that is of interest. The postcard is larger than the usual postcard of this period (1950s). It is 6 1/4 inches wide instead of the usual 5 1/2 inches, and it is 4 1/2 inches high instead of the usual 3/12 inches. 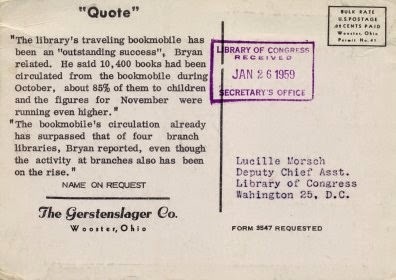 It is an advertising postcard from The Gerstenslager Co. of Wooster, OH, the largest maker of bookmobiles for several decades. The postcard was mailed to Lucille Morsch of the Library of Congress and received by LC on Jan. 26, 1959. 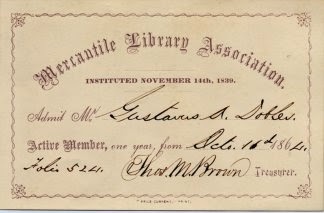 Since I am also a collector of postal librariana related to the Library of Congress, this is also of special interest to me. In Norman D. Stevens' book A Guide to Collecting Librariana (Scarecrow Press, 1986) he mentions that Lucille Morsch was a collector of library postcards and that she donated her collection to him before her death. This is probably why the bookmobile postcard was in his collection. It also means that the postcard is now in the hands of the third library postcard collector (me). 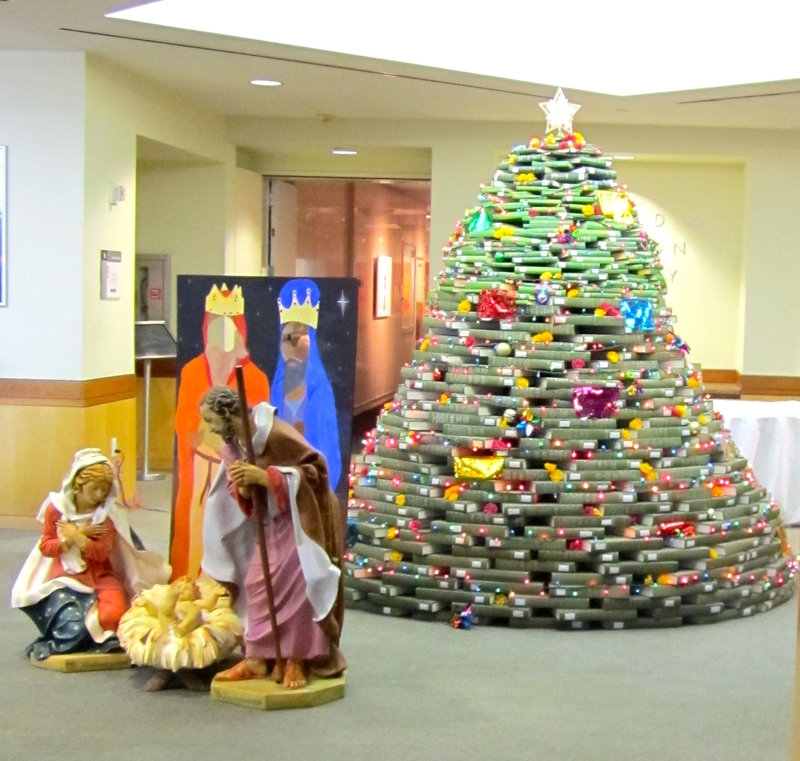 As we get ready for the holidays here in Gleeson Library, I found myself wondering how we got our modern tradition of Christmas. What’s up with bringing a cut pine tree inside your home to decorate? What’s up with all the poinsettias? Why do Brits give gifts on Boxing Day, December 26, while here in the US we give gifts on Christmas Eve and Christmas morning? The Gleeson tradition of erecting a Christmas Tree out of the National Union Catalog. Way to go, Access Services! The Folklore of American holidays by Hennig Cohen and Tristram Potter Coffin, editors, devotes nearly 40 pages to Christmas, and confirms that the religious roots of Christ’s birth coinciding with the date we now know as Christmas melded with pagan and mythological traditions: “The western date of Christmas was made to coincide with the Roman midwinter festival of the Kalends… many of the pre-Christian rites are still celebrated as part of Christmas: the evergreen decorations, the exchange of gifts or strenae, the indulgence in food and drink, the license in kissing and sexually related activities, the mumming” (p. 371). 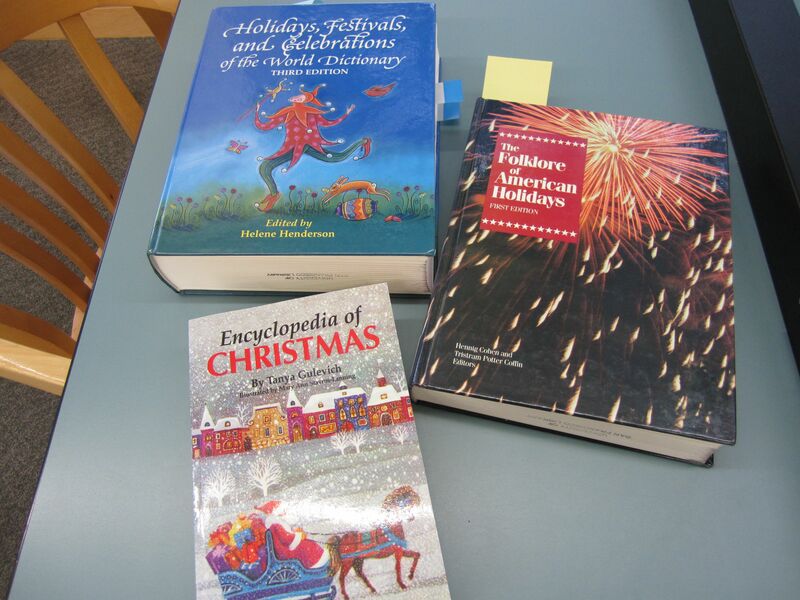 Holidays, festivals, and celebrations of the world dictionary by Helene Henderson, editor. This one is fun because it has pages and pages of entries dedicated to Christmas the world over, so you can easily see how Christmas traditions vary around the world. Through the course of my recent research on holidays, I was fascinated to see a world wide movement of nationalizing holidays took place in the last half of the 19th Century — Thanksgiving was made a national U.S. holiday in 1863 by President Lincoln (previously it was a Northeastern holiday) and Boxing Day was made a national holiday by Parliament in England/The UK in 1871 (previously it was known as St. Stephen’s Day). There have been feasts and festivals all throughout history, but much of our modern day holiday traditions have only been standardized and canonized in the last 150 years or so. There is still time to check these out for yourself! Gleeson Library will be open until 6 pm today 12/19, 10 am – 6 pm tomorrow 12/20, 8 am – 6 pm on Monday 12/22, and 8 am – 4 pm on Tuesday 12/23. See our hours for more info, and most importantly, have a very merry Christmas!